New Space Station Crew Launches Thursday: Watch It Live! Russian cosmonaut Alexey Ovchinin and NASA astronaut Nick Hague pose in front of the Soyuz MS-10 spacecraft during prelaunch training Sept. 26, 2018. The duo will launch to the International Space Station on Thursday (Oct. 11). Two new crewmembers will blast off on a fast-track flight to the International Space Station on Thursday (Oct. 11), and you can watch their liftoff and docking live online. 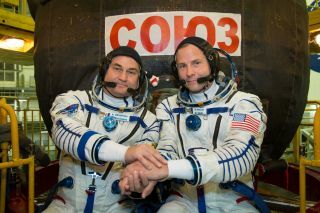 Riding atop a Russian Soyuz rocket, the rookie NASA astronaut Nick Hague and Russian cosmonaut Alexey Ovchinin will launch from the Baikonur Cosmodrome in Kazakhstan at 4:40 a.m. EDT (0840 GMT; 2:40 p.m. Kazakhstan time). Their Soyuz MS-10 spacecraft will arrive at the space station after a quick, 6-hour or "fast track" rendezvous rather than the traditional, two-day route. Hague and Ovchinin will open the hatch to their spacecraft at 12:45 p.m. EDT (1645 GMT), when they will be greeted by their three Expedition 57 crewmates: NASA astronaut Serena M. Auñón-Chancellor, European Space Agency astronaut Alexander Gerst and Russian cosmonaut Sergey Prokopyev. That trio of space travelers arrived at the station in June and will return to Earth in December. Hague and Ovchinin will spend about six months living and working aboard the orbiting lab. "The crewmembers of Expedition 57 will continue work on hundreds of experiments in biology, biotechnology, physical science and Earth science aboard the International Space Station, humanity's only permanently occupied microgravity laboratory," NASA officials said in a statement. This will be Hague's first spaceflight. He was selected to join NASA's astronaut corps in 2013 as a member of a group called the "8 Balls." Ovchinin will be returning to space for his second mission, following his six-month stay at the space station during Expedition 47/48 in 2016.